Thoughts on the Nissan Titan? My 15 is great *knock on wood*. Definitely the best year. That front end just looks like a Chevy should. Not sure why they only kept it around for 2 years. I've got 56k on it, and so far so good. Thanks! That one is a 2006, so I can definitely vouch for that being true. My dad actually talked to the guy that bought it the other day, and it's still kicking! Back to the original topic.... I had a 1st Gen Titan before I bought my current Silverado, and I wouldn't hesistate to own another one. I owned it 10 years, and put 184k on it, and it NEVER ONCE saw the inside of a mechanic shop. Worst problem it ever had was a broken clockspring, and I changed that myself. Other than crappy MPG, I have zero complaints about that thing. 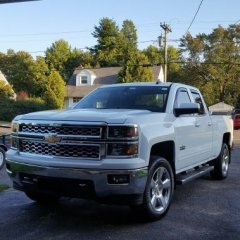 When it came time to buy a truck, I wasn't really in love with the looks of the new ones, and I wanted better MPG as I drive for work now, plus I come from a big Chevy family, so I came back home to the bowtie. The back window, tailgate band, and steering wheel from my first truck, a 1981 GMC Sierra Classic. I had changed the steering wheel out, so I made a plaque for it and mounted it on my wall. After I wrecked it , I took the back window out because it was hanging and about to fall out. After one night in the junkyard, someone went and stole things out of it and off of it, so I took off pretty much everything that I could unbolt. I had the window and tailgate band stored in an old shed at my parents' house, pretty much forgotten about. My dad was tearing down the shed a while back and asked if I remembered that they were in there. Told him I wasn't sure what I would do with them, and he suggested this. I love it. I use an old hard drive iPod in my 15. Sometimes it works, sometimes it doesn't. When it does work, it's very laggy. I read somewhere that MyLink doesn't like the hard drive iPods, as it's made to work with flash memory type devices. They're doing a 2019 "classic" as well. Same as 2014-2018. That nose is terrible. Looks like the grille is missing. Just changing those little details are pretty much perfect. The mirrors on the windows and a straight body line. And a bumper that wraps around! Kill those hanging jowls lol. I'd buy one right now if they looked like that! That's what I did with mine. It sounds too good that way to spend more on a new muffler haha. Nice growl, not too crazy. About as loud as the Magnaflow I had on my last truck, maybe a little quieter at idle. I believe the current ones came out in 2018. I'm thinking it's the valve. Clamp it open and see if it gets any better / worse.